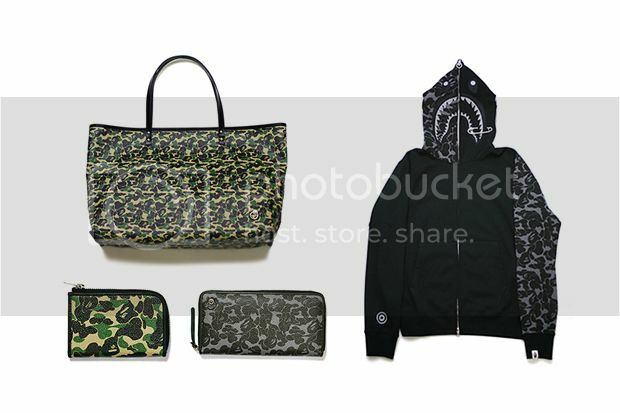 A Bathing Ape and JAM HOME MADE have teamed up this season on a neat capsule collection featuring accessories and a hoody. First up is A Bathing Ape’s signature ABC SHARK HOODIE, which features a black body interspersed with either green or grey-scale BAPE camo and featuring JAM HOME MADE’s signature pin as a motif on the hood’s shark graphic. The complementary accessories include a leather tote, long wallet and coin case, each of which features an all-over camo print in both green or grey. Look for the collection now at JAM HOME MADE’s online store.